Despite months of planning, this year’s Great Moot held a few last minute twists and turns for all concerned it would seem. On my part, I didn’t find out about the venue change until the day before I was due to set out for London and to add to the chaos, the new tweed jacket I’d ordered for the occasion wasn’t due to arrive at the shop until hours before departure. As I listened to the weather girl announce a sharp drop in temperature I glanced at my hoodie and beanie, but I was determined to dress like an Englishman. Meanwhile, down south, Asrad had bigger things to consider than his wardrobe and despite good advice from the Havamal he’d had a few sleepless nights worrying about the many aspects of organising the premier event in the Rite’s calendar. My journey began in Shropshire just before noon and I’d been saving for months. The article Reginhard had penned in a recent ORB hit the nail on the head regarding saving weekly in order to attend Folk Camp and the GM. Unfortunately a few unexpected bills had left me with no option but to dip into my overdraft and so I drove to London with one eye on the fuel gauge and one hand fearfully gripping my wallet. I’d booked into the same hotel as last year in Borehamwood and arrived about 16:00hrs on the Friday afternoon. It gives me no satisfaction to say that while Asrad was likely pacing the floor thinking about logistics, I was having a lovely snooze and listening to soothing music on my ipod. At 18:00hrs I stepped into the hotel lobby to see Hariulf and his family along with Chris from the Einheriar Hearth. Odinism brings our people together and I shook Hariulf’s hand just as warmly as I shook Chris’s, despite greatly differing lengths of friendship. Our religion binds us and a definite camaraderie exists between our members that you do not find elsewhere. As usual Tyrsson had organised the pre-GM social for those staying in or near Borehamwood which consisted of a drink at a local pub followed by a folkish buffet after which we returned to our accommodation. The Great Moot is our most important event but I believe throughout history our folk have managed to combine seriousness with humour in a very carefully balanced manner, just as our religion precisely balances its esoteric and exoteric aspects. It is essential thaat the seriousness of our religion is properly respected but it is also important to find time to socialise and allow the pressures of life to be released. Many of us do not see each other for months at a time and the social side of Odinism is just as important now as it was for our ancestors. I awoke early on Saturday morning and felt none of the nerves I’d experienced the previous year. I dislike cities and am not fond of the kind of crowds and confined spaces found on public transport so for me the change of venue to a more rural setting was very welcome indeed. I took my time getting ready and went over the bullet points of the talk I was to give later that day. I’d been doing some reading regarding the use of the imagination in order to achieve real-world possibilities and the opening of our third eye or forehead chakra which joins the god-force within to the god-force without. 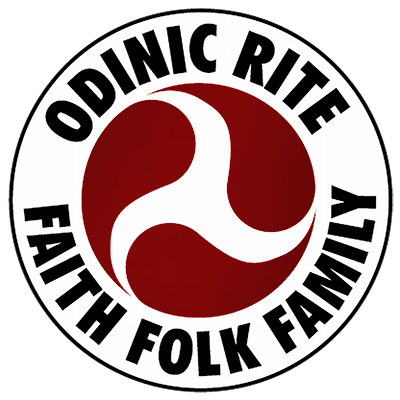 While other religions appear to seek to suppress their followers, Odinism and the ceremonies of the Odinic Rite attempt to empower its followers. It’s all there in black and white. Unbeknownst to me, Harry was later to deliver a talk entitled ‘The Christian Hangover’ and it struck me that, just as in the previous year, the talks delivered at the GM fit very nicely together despite the fact that each speaker did not consciously know what the other would say. It doesn’t take much to understand Wyrd when it is actively experienced. I arrived at the village hall at 11:00hrs which was to be the home of the Odinic Rite for the rest of the day. Heimgest was already there and I saw faces I recognised and some I did not as I entered the venue. I cannot stress how positive I felt even before the GM was officially opened. I can see a day when the Odinic Rite have their own meeting hall and it would look something like the one in which we gathered that day. To be blunt, I quickly become sick and tired of those who do not allow themselves to visualise success. Unfortunately, the modern meaning of success often refers purely to matters of personal wealth, but as I have learnt, if something can be imagined it can be achieved. I see a day when an OR-affiliated Trust is set up, with funding provided from whatever sources come to mind, and an estate is purchased with acres of woodland in which to hold Folk Camps. We shall have a fully equipped yet traditional building complete with educational facilities, mead hall, wood burning stoves or fireplaces, great works of Odinic art and conference facilities where we can hold future Great Moots. Allow yourself to visualise that too, for who is to say a dream is no less real than its physical counterpart? Only time separate the two. After the GM was opened and the holy Ve was called, Eowyn was first to speak. As with other’s talks I will not go into detail here lest they be reproduced as articles in their own right. Following our first speaker a Special Ritual was conducted with the intention of strengthening the archetype. Immediately after the ritual I was called forward to deliver my talk, and it took me a moment to compose myself after spending the previous ten or fifteen minutes effectively meditating on things which meant a great deal to me. As I spoke I looked at the crowd; some were relatively new to the OR, others were much more advanced than me. Public speaking is not easy and I hoped my message was clearly conveyed. Soon after my talk, Harry gave his. It’s great to see people active with so many years ahead of them. Walking the path of Odinism is never easy but to see others not only following the path but taking turns to step out in front is very uplifting. With so much information to digest, it is important to have a break, and Asrad chaired the GM with precision, allowing those in attendance to gather their thoughts. Between the in-depth speeches were a number of very different agenda items, one being Reginhard and Tyrsson demonstrating tactics for self defence. This year they focussed on the use of the stick as a defensive weapon, with the definition of a stick extending broadly to every day items such as the innocuous umbrella. After lunch the auction was held, brilliantly hosted by Sigbert. Items included everything from an astounding piece of artwork sent to England from one of our overseas incarcerated members to a sword, a bottle of mead, hand-made bookmarks and rune booklets and so much more besides. It is worth considering that even if you cannot attend next year’s GM, perhaps you might send something for auction as not only does it raise essential funds for the Rite, it also bonds the spiritual and the material together, especially if the item has been made by a member. Asrad CG and Heimgest DCG were last to speak; Asrad offering an insight into the organisational aspects of the GM and Heimgest gathering together the essence of this most important Odinist event and delivering it back to us in a way that left us all feeling proud to be a part of the New Awakening. As the day drew inevitably towards its conclusion, the time came for the most important part of the GM, namely the blot. Many of us blot alone; some are Hearth members and are fortunate enough to gather regularly and hold ceremonies in groups. But at the Great Moot many more of us can come together and focus our positive energies which then radiate out across Midgard and our touch Folk. This year’s ceremony was entitled, ‘A Blot of Remembrance, Becoming and Deepening, Including Bael – Ceremony of Departure and Remembrance of Hervor OR’. Words cannot accurately describe the feelings evoked during this ceremony, and it is perhaps not the best idea to attempt to trivialise emotions and spiritual practices as it is almost impossible for me to convey these things. I can, however, describe the feeling in my gut during and at the end of such ceremonies; it felt good and wholesome. The blot included a short soil ceremony and it was uplifting to hear so many positive words as the mead horn was passed around. After the blot, those in attendance enjoyed a substantial buffet before the hall was carefully tidied up. One of the nice things about holding the GM in a rural location was the chance to finish the day with a short social at a village pub. The landlord was genuinely pleased at the extra custom and a good selection of ales were on offer. There was so much to discuss and so many people to talk to that my only real disappointment was how fast the hands on the clock moved. The one great stumbling block we have yet to overcome is how we can gather together and talk until the sun comes up. Perhaps at a future Great Moot this issue will have been resolved and one final blot can be held at the rising of Sunna the following morning before we go our separate ways. As for those staying in Borehamwood, we did extend the evening until ‘time’ was called. For me, the physical and financial effort required to attend the GM was easily worth it. Financially and physically draining, yes… but spiritually rewarding it was too. Be healthy – be whole.